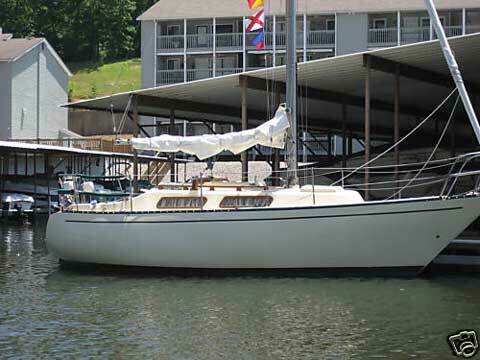 1980 Hughes 26E "SECOND WIND"
a fully restored 1980 Hughes 26E Sailboat. For those of you not familiar with Hughes, They were built in Ontario, Canada, in the 1970's and 1980's and are similar to C & C's. Very stabile - easy to sail. 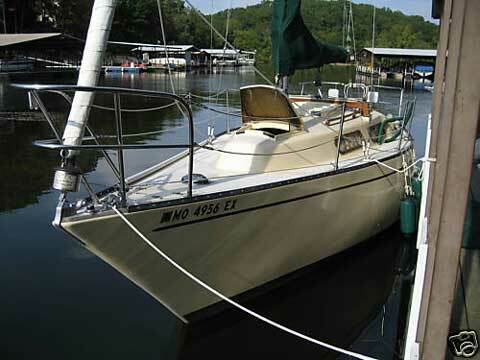 It is a fin keel design with a skeg rudder and it is an extremely sea-worthy pocket cruiser. It has been lovingly maintained and upgraded over the last 4 years. This boat is completely self-sufficient with its self-launching trailer and mast raising system! Additional removable inner forestay allows you to set the included staysail just aft of the furled Genoa when the wind really pipes up. I have sailed this boat in 30 kts with reefed main and staysail and it handles beautifully. Mast raising system. Tired of high marina fees? The self-launching trailer and this mast raising system make you completely mobile. Interior Features: Beautiful teak interior. Hull sides are insulated and finished with teak strips. Very quality construction, warm and pleasing cabin. V-berth: New custom made one piece 4" foam mattress. It is VERY comfortable! No more falling between the cracks in the cushions and waking up with an achy back! Teak shelves with fiddles on port and starboard sides in the V-berth. Reading light and fan mounted on bulkhead (both DC). Main Salon: Full length galley to port with 2 burner alcohol stove, microwave, stainless steel sink with pressurized water, 3 bottle teak wine rack, deep icebox with butcher-block lid, and TONS of storage space in two cabinets, with shelves under the counter top. Cabin is wired for shore power with several AC outlets throughout the cabin. Automatic battery charger keeps the main ship deep-cycle batteries fully charged when on shore power. 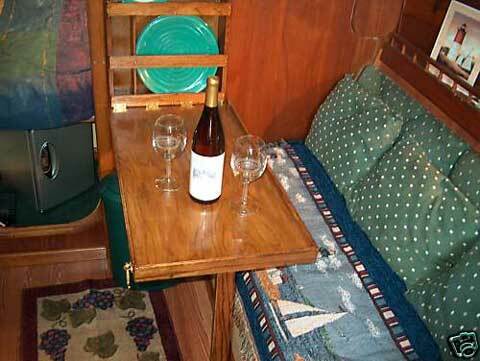 To starboard is a settee with a fold-down bulkhead table and a quarter berth aft. 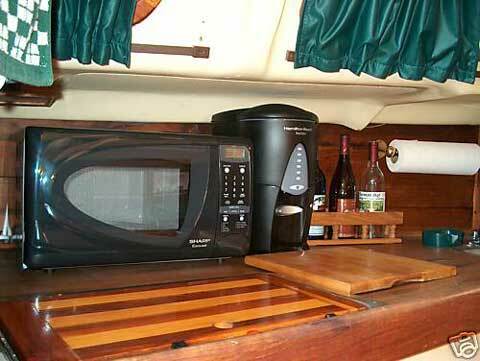 Above the quarter berth is a VHF radio, SONY stereo (AM/FM, CD, IPod/MP3 compatible) with speakers in cabin and cockpit. Custom wooden rack holds IPod and binoculars (not included). To port is a fully enclosed head with vanity countertop, stainless steel sink with pressurized water faucet, and good storage below the counter in teak front drawers. 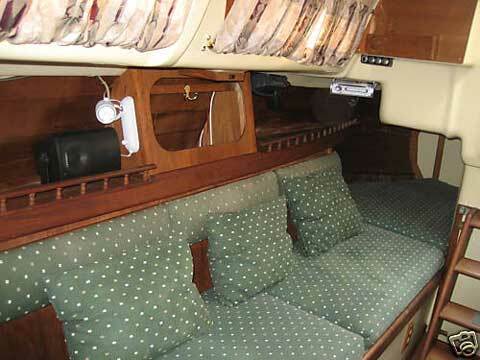 Head compartment has a teak door or it can be left off and used with a curtain (both included). Head holding tank is 10 gal. Cockpit: Varnished tiller with cover. Sunbrella cover that goes over the main hatch and cabin house. We always use this cover when the boat is not in use. Ample seating space. Large cockpit locker. Cockpit stereo speakers. All exterior wood was re-varnished August 2008. Custom made, bi-fold swim latter with wooden step pads. This swim ladder is extra deep, goes three steps down into the water, which makes boarding SO much easier than most ladders which only go just below the surface. It will be difficult to give this ladder up! Engine: 15 HP OMC Saildrive. Still running GREAT! Starts first crank every time! Water pump impeller replaced March 2008. Have some spare parts and all original manuals! 15 gallon fuel tank. 4-1-09 added a Nissan 5 horsepower 4-stroke outboard on outboard mount as a back-up ( although the OMC runs like a scalded cat) which is in excellent shape. 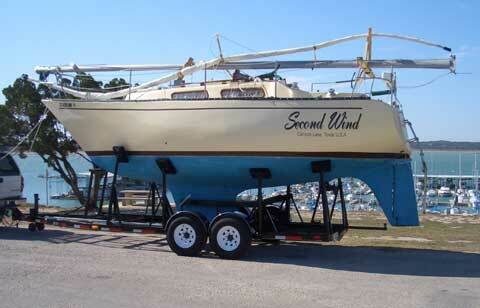 2006 Coose Sailboat trailer is included with this vessel..
All brakes and lights are in working order. We bought this trailer new in 2006 and have only used it four times. It is rugged and versatile. Will fit any sailboat 25-27 ft. This trailer was $6000 and is like new. Boat is in the water at Canyon Lake Marina in San Antonio Texas. The slip is assumable and comes with unmetered electricity and water. Includes everything down to the PFD and all extras. I just sold the boat last night!